Home of the famous Hollywood sign and Walk of Fame, Los Angeles is the place to visit for anyone interested in film and television and hoping to get a glimpse at some famous actors and artists. Stroll down the Walk and enjoy the glamorous atmosphere and famous surroundings, or take a break on the Santa Monica pier and watch the sun set on the sea. Famous for its zoo and stunning beaches, San Diego is a destination with a young feel to it. From the trendy Gaslamp Quarter to the historical Old Town, the city is home to attractions that are bound to appeal to a wide range of visitors. The Horizon Court aboard Royal Princess features a dedicated pastry shop. Here guests can indulge in fresh-baked goodies throughout the day, including croissants, pastries, hot desserts, freshly baked waffles and French toast at breakfast; classic and modern desserts at lunch and dinner; tea sandwiches, cookies, desserts and waffles at tea time; and special show pieces and flambés in the evening. Aboard Royal Princess the sit-down restaurant’s complimentary menu has been expanded to include a variety of Italian antipasti, soup and salads, a hearty calzone and pizza baguette, and delicious baked pastas in addition to desserts. With 121 seats, Alfredo’s is the largest such pizza restaurant at sea, and features an open kitchen where guests can watch as chefs craft their pizza. The complimentary pub lunch, which has become a big hit with guests since it debuted in 2008, is served daily across the combined space in the Crown Grill and the Wheelhouse Bar. The Royal Princess offers the full traditional pub-style lunch on all sea days- and on port days serves fish and chips and a ploughman’s lunch- along with signature brews. One of Princess’ most popular casual dining options, the Horizon Court buffet on Royal Princess provides additional dining options, including action station choices such as Asian cuisine, Mediterranean dishes, a pasta corner and salad-tossing stations. For early risers on the go, new “Grab & Go” options are available, while healthy breakfast options offer the fuel guests need to make the most of a day at sea or ashore. Those who love to sleep in will even find a special “late, late risers” breakfast corner. At lunch, a variety of new live stations feature a regional flair, including a rotisserie, and Japanese Hibachi Grill. The Concerto Dining Room offers anytime dining like the Symphony Dining Room where guests can choose when they want to dine and with whom each night. The resident entertainer in Crooners will keep the crowds singing along while guests choose their favourite from the bar’s famous selection of more than 50 martini varieties.s. Royal Princess’ energetic dance club, conveniently located on Deck 6 near the Atrium, Club 6 offers a vibrant space with an intimate atmosphere and contemporary decor. Guests can grab a cocktail and dance to their favourite hits. The resident DJ keeps the party going whether guests just want to people-watch or get up and move to the beat. 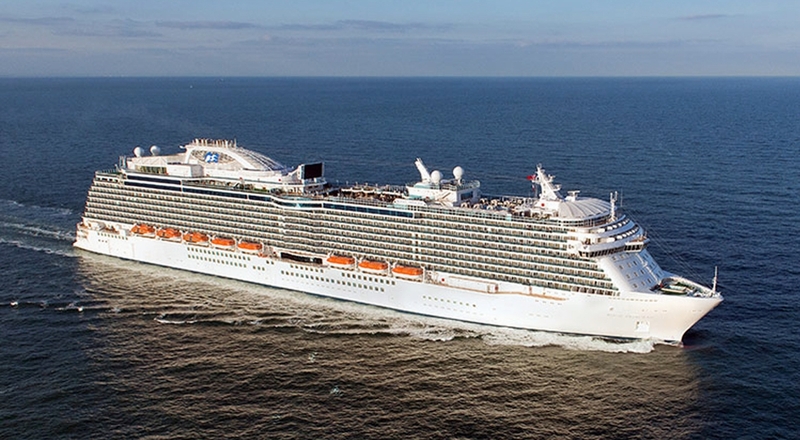 The Princess Casino aboard Royal Princess features the latest slots and table games. Guests can indulge in their favourite games of chance, from blackjack to Texas Hold’em and roulette, or participate in the excitement of slot tournaments. Standing at the heart of the casino is a stunning spiral staircase which leads up to Deck 7 and the onboard boutiques, while an adjacent bar makes it easy to pop in for drinks between games. With unobstructed sight lines from every seat, the Princess Theatre offers high-definition screens and a state of the art lighting system to enhance each show. This spectacular space for the line’s original production shows and entertainers debuts with two new productions on its stage – “Fiera!” takes guests on a journey the fairground, and “Bravo… A Royal Celebration” a celebration of lights opera, musical theatre and p’opera. Two favourites- “Spectacular!” a musical revue extravaganza, and “Sweet Soul Music” an upbeat tribute to Rhythm and Blues- will also be featured after their rave debuts on Royal Princess. This fantastic water and light show brings intrigue, beauty and excitement to the top deck pools with fountains that shoot plumes of water to delight and amaze all members of the family. Royal Princess also boasts a second-level stage above the pool area where live bands will play during unforgettable evening parties. The television studio aboard Royal Princess features programming throughout the day from 8 am until midnight. Guests can enjoy live talk shows, demonstrations and performers here, including the daily Wake Show. With seating for just under 300, the space gives guests a more intimate opportunity to meet the ship’s entertainers, play games and enjoy refreshments with the dedicated café.